Thank you to all the pupils and schools who sent in over 2,000 entries. Eight were shortlisted and open to a public vote through our website. 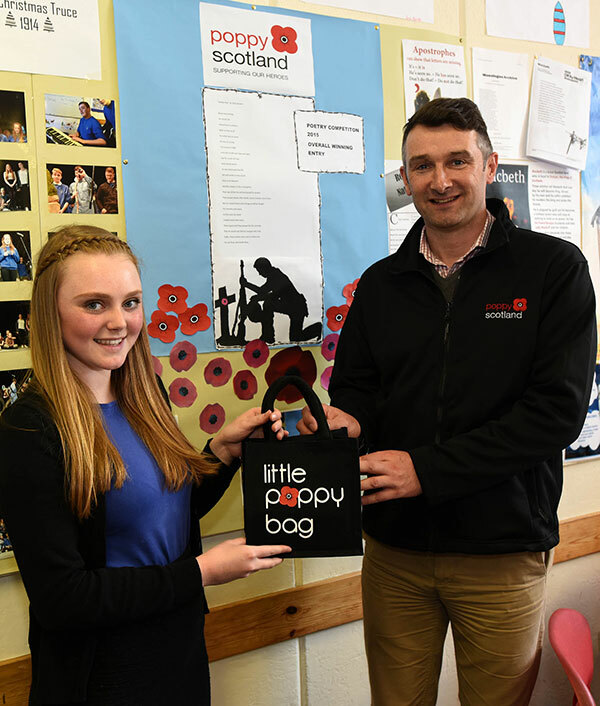 We are delighted to announce the overall winner of the competition is Holly Brown, an S3 pupil at Nairn Academy with her moving poem, “Soldier Boy”. Holly has won a camera donated by our sponsor Viking Direct and a poetry workshop for her class. Her poem will also be included in our education materials this year. And risk his life each day and night. He had loved so very much. That caused death after death, every minute, every hour. That he would not fall but conquer the rival. As one final, fatal bullet flew. Runner-up was “Listen”, by Sarah Normand, a P7 pupil at Abernethy Primary School. Sarah has won a poetry workshop for her class. There are people losing their lives? If there are thousands of people losing their lives every day? Then we know this world needs to change. Congratulations to Holly and Sarah and very well done to all the entrants for their thoughtful and emotive entries. Thanks also to their teachers for their support. In the autumn our new education packs will be delivered to every school in Scotland, so keep a look out after the summer holidays to find out more of what Poppyscotland will have to offer you then!